Our local neighborhood newspaper White Rock Lake Weekly hired me to write an article for an upcoming event. So enjoyed freelancing! Click to see the printed version & read on for the unedited version. “’A Texas Veggie State Fair’, all vegan…humm?” That’s exactly what I thought too. For a couple of months I have been anticipating the arrival of this event…it finally arrived. As I walked up the hill top to Winfrey Point the familiar fair smell of fried food was floating in the air, live music was making its way and faint giggling, laughing and chatting were competing for attention. The fried food vendors were definitely the most popular, seemed like everyone was ordering a vegan corn dog + fried pickles. Lines were over an hour wait. The vendors lacked commercial equipment that may have help keep up with the demand; however, the home style outdoor kitchen is what made it super attractive and personal. By 3:30pm a few vendors had closed posting a ‘sold out’ sign. This was the 2nd Annual Texas Veggie State Fair hosted by Dallas Vegan and the turn out according to Christina, a vegetarian chef, was “completely unexpected, we’re so happy to see veggie passion people”. The humidity was thick the sun was strong, I made my way to the indoor vendors for some air conditioned relief. 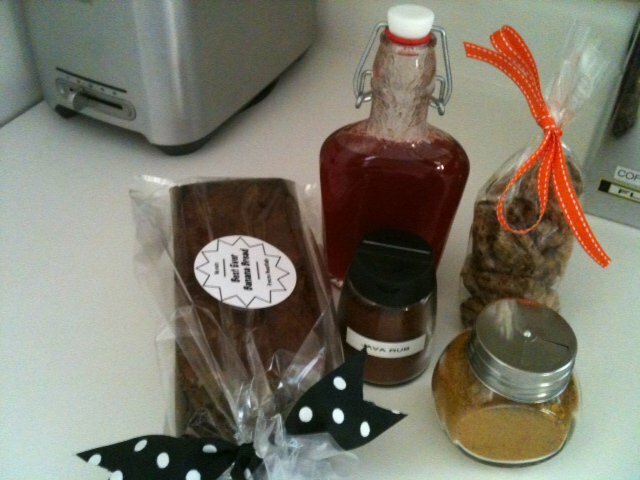 To my sweet surprise a “Raw Dessert” (Famous 5 minute Blondies) cooking class was just about to begin. Chef Amber Shea, blogger and new author, http://www.almostveganchef.com/, would be conducting the class. The metal chairs were nice and cold, very comfy. I looked around and it was nice to see beautiful people of all shapes, size and color, I’m not a vegetarian (I do subscribe to the monthly magazine Vegetarian) but in my mind all vegans and vegetarians are thin…and thin I’m not, so I was happy to see an array of lovely figures...some vegetarian some not. Shhhh class is about to begin. Bravo! Bravo! Excellent presentation, plus the results…delicious! I loved that the recipe was gluten free. Inspired, I wanted to challenge my skill by creating my own ‘raw dessert’. Here is my version of raw Pecan Pie. Combine the pecans and sugar in a food processor and pulse till coarsely ground, over pulsing will release too much oil and produce a butter paste. Add the vanilla and salt, pulse until well combined. Add 3 dates at a time, pulse and repeat with remaining dates. Spoon the mixture evenly into 24 petite cupcake molds. Press the air out of the mixture, with a small flexible spatula or the back of a spoon. Refrigerate for 30 minutes before serving. These bites should be stored in the refrigerated or freezer. Looking forward to the 3rd Annual Texas State Veggie Fair, I will return. I love Figs! I picked up a pint of organic black figs this week and ate them all by myself, I wanted to share but Bebe and my husband both declined...I didn't push the issue. I thought about how I'd prepare them...once home I ate them all by their little selves...no cheese, no pastry just organic. 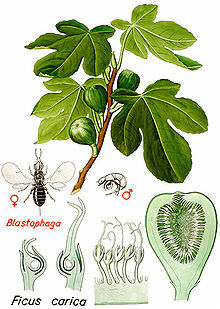 During fig season I so desire my New Mexico home life. At the Ranch, my Mom planted a fig tree over 35 years ago, it is so beautiful. The fruit is so sweet and tender. One little annoyance is that we are in constant competition with all the little birds that love figs as much as we do. I've asked Denise Molina, founder of The Honey Crew, to share her school lunch ideas with Honey Girl Kitchen fans. Once the Fall semester began Moms everywhere were fretting about what to pack their children for lunch. I thought Denise would be perfect on this subject...every morning she packs a lunch for her kids and husband. My daughter is in PK4 till noon, so I make her lunch at home...however 2 weeks out of the year I will be responsible for classroom snacks for 12 beautiful babies (Carmella's my only, she is my baby). Look for the snack blog in the next week. I know this special contribution from Denise will be a good inspiration to pack healthy and easy lunches for your children, your self and your spouse. Denise thank you for sharing . Please enjoy. school is back in session, and i am constantly on a quest for different, simple, and healthy lunches that will excite my girls' palettes. our lunch schedule is up on our refrigerator and broken down by main, side, snack, and drink. there is also a place for my girls to create their own lunch. they can mix and match the mains, sides, snacks, and drinks....or they can make requests. i pack a school lunch for my 4 year old twice a week for her 2 extended days. for my 8 year old, she is allowed to buy lunch once a week (she almost always chooses wednesdays, pizza day), we pick a lunch together from our lunch schedule twice a week, and she mixes and matches the other 2 days. for this to be successful, i must be organized. i love a well thought out good old fashioned handwritten grocery list. i love the grocery store, as long as i have my organized list. if you would like to have the google spreadsheet version, click on this link and request to have it shared. i always boil at least half a dozen eggs at the beginning of every week. my 8 year old likes them whole. my 4 year old likes the yolk taken out. for us, the hard boiled egg is sometimes used as a snack, a side, or a main. another school lunch staple (and dinner too for that matter) is chicken noodle soup. although i must confess, it's rarely homemade by me. darlene - i know you are so disappointed! it's usually homemade by whole foods. on the occasion that i do make it, the girls always request the whole foods version saying it is "so much better". they win. lastly - the honey crew granola, of course. my girls eat it as cereal, eat it for a snack, or eat it for breakfast on the go on those mornings that we just can't get it together in time. it's always in my purse to provide that high protein, high fiber, energy source whenever we are on the verge of a meltdown or about to embark on some kind of activity. itty bitty foodies - great restaurant reviews and food ideas/activities when kids are in tow. gwenyth paltrow's my father's daughter - i know i know. she leveraged her fame with getting a cookbook deal. maybe. but it has lots of really great, high quality, simple, family friendly recipes. i love it. speaking of gwenyth, i also love her blog, goop. whole foods, particularly whole foods park lane - so lame. i know. but i am here all the time. in my post-mom life i want to work here, and i bet my husband would welcome the discount! my 8 year old and i stroll through the aisles and come up with school lunch ideas together. it gives her a sense of control and contribution, and i feel i can trust almost all things there without spending too much time reading labels, etc. win win. lately, i have been trying lots of different foods from their raw foods section, like raw cacao powder. a chocolate lovers dream come true with amazing benefits. try this raw cacao and mint smoothie: 1 cup almond milk, 1/2 banana, 1T raw cacao, 4 fresh mint leaves, touch of salt and a little cold water. mmmm! Grilled veggies with Roasted Pepper and Walnut Hummus. This hummus was a swap from the September Dallas Taste The Honey Food Swappers, made by Cindy S. It was so flavorful. I will definitely be making this. Mix, shake + stir all ingredients. Keeps for 1 week. Tuesday Lunch. Same as Monday just added angel hair pasta. So delicious. ﻿﻿Any grilled veggies I still have on Friday I'll puree with a homemade chicken stock. Buen Provecho. Yesterday we received a same day invitation to an early dinner at my girlfriend, Denise's home. Love these type of invites. Her words "I don't know what's gotten into my husband but he's grilling steaks and just asked if I have a food processor for chimichurri sauce, wanna come over? "...could not get "yes, what can I bring & what time?" out fast enough. The moment we were greeted, I smelled a familiar smell but could not pin point exactly what I was smelling...as I laid down the goods I brought to share (green beans + prosecco) I said "smells so good"...Denise replied "don't lie"...I giggled because that is not the response I expected. I looked in the kitchen and thought 'ok, I see why she said 'don't lie' the grilling has not yet begun' ...the appetizer being served was little bowls of grilled veggies, avocado and a European aged white cheddar on slate with baguette rounds. The familiar scent was the grilled veggies...yes so simple they never demand attention, they should. Denise had cut the veggies in sticks and grilled them on an electric flat top griddle. Squash, zucchini and onions lightly salted and nicely browned. On many occasions I have grilled veggies for numerous parties but always cut on the bias...I loved them in a thick stick form, seemed so new to me. My husband commented on how he loved the veggies...seemed new to him too. The Argentina themed dinner was heavenly: a perfect grilled steak, grilled corn on the cob, grilled asparagus & the chimichurri sauce was so tasty...parsley, lemon, EVOO, garlic, vinegar, red pepper flakes + love...uhmm so good. So today I was motivated to make grilled veggies for the week: 3 Mexican calabasita, 1 zucchini, 1 red bell pepper, 2 large onions, salt + pepper. The newness of this grill is that it is seasoned differently, I normally add 'Herbes de Provence' which is nice but I now relize it over powers the delicate flavor of the veggies. I will use 'Herbes de Provence' once again...soon. For now I will enjoy a simple seasoning of salt, pepper & a splash of lime on my grilled veggies. These veggies will be enjoyed all week. I will take you thru a photo succession of meals in which these veggies will shine. Buen Provecho. Thank you my friends for a lovely Saturday night family dinner. Morning. Bebe requested 'tiny pancakes and milk with a straw, please' ... "My Pleasure". I hopped out of bed turned on the griddle and gathered my ingredients. Pancakes are easy in this house, I've adapted a recipe from Nigella Lawson's Instant Pancake Mix the recipe is in grams ... I have a handy little kitchen scale that converts grams to ounces & kilograms to pounds for me. I have to say these are the best pancakes ever. I prefer buttermilk over the milk that is called for this recipe + I add cinnamon to my instant mix + vanilla to the wet ingredients + always use organic flour...all this ='s love. Here is how the story played out in my house this morning. First combine wet ingredients then add dry...8-10 gentle stirs. Batter will look lumpy...let it rest for 8 minutes. 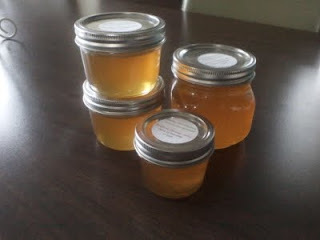 At the Dallas Taste The Honey Food Swappers I brought 4 32oz containers of the mix (makes 4 batches) plus I paired it with a 1/2 pint of my homemade Organic Orange Jelly. It was a swapping success. Cheryl from ittybittyfoodies.com, Dianna, Sandra & Carrie were my choice swappers. Only recently did I start obsessing about pressure cooking. Why? Well, because it's hot outside and I do not want to heat up my entire house. Plus, I am constantly reading or hearing how almost every country except Americans use this fine kitchen tool. I'm always interested in how people cook and what tools they love. I inherited my 1st presto 6 quart pressure cooker from my mother-in-law and it has sat in the storage room for years...I pulled it out yesterday because yesterday was the day I was determine to get this right...or at least attempt it. I had just been grocery shopping and I found some really nice oxtails. 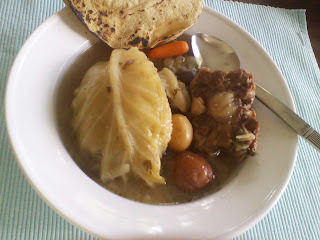 My Dad made oxtail soup often...so delicious. Miss him. I pulled out Mommie Dixie's pressure cooker, washed it and began filling it: 4 oxtails, 1 chopped onion, 2 garlic cloves, salt, pepper, cumin, oregano and water 1/2 way full, just as the pressure began building up it began spewing water (need to replace the seal)...I turned the burner off, let the pressure subside. 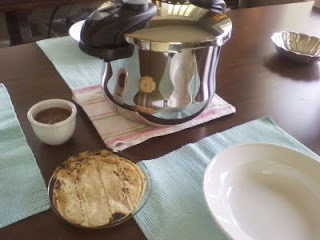 In the mean time I pulled out my new Futuro Pressure Cooker . New? Yes told you I'd been obsessing about a pressure cooker, I knew I wanted a big one for my catering...I'd seen this in a magazine and I knew this one was the one. Made in Spain. It's so pretty and shiny...it did not disappoint. I cooked the oxtail soup in 45 minutes of pressure. Once the pressure was taking place I set the timer for 25 minutes at that point I added the veggies: cabbage, celery, petite potatoes, carrots...and cooked it for 20 more minutes. The whole house smelled amazing. The broth was unbelievable, it had so much depth...so little time and such depth...who knew & why didn't I know. Husband and baby loved it! I know oxtail does not sound fancy but it really is a beautiful dish. 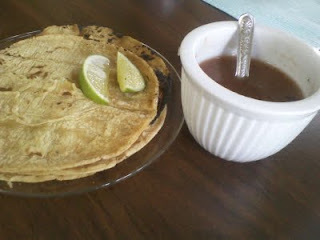 I served it like my parents did, with corn tortillas, lime and salsa. I'm totally hooked. This was such a great investment. Today I cooked two batches of black beans (20 minutes) and again the broth had such depth. All ingredients in the pot. Once pressure begins set timer for 20 minutes. Upon pressure releasing salt to taste. Done. Berries on my mind....yes all the berries above will tickle your thirsty tongue. Honest. Spinach leaves are so plump right now. Yesterday as I was making a spinach salad I sneaked a leaf and to my surprise with each bite I could feel the spinach juice bursting. I had never experienced that before or maybe I never paid attention. Spinach is currently in season...remember to buy organic if you can, it is one of the dirty dozen. Twice this week I made Talapia Fish Sticks. I have a 4 year old and she loves fish. I have tried serveral versions of making fish sticks & chicken tenders/nuggets....they were always ok but now I have mastered it. So simple I don't know why I did not use this method earlier....I was making it more complicated than it really should be. As Carmella ate her dinner she'd nod her head forward making sounds of approval, "Uumhumm, uumhumm". Heat oil in skillet. Have 3 prep pans in this order plus a pan to set your prepped filets in....1) flour & seasoning salt, mix well 2) Eggs & water, mix well 3) panko. Cut the filets vertically, each filet should yield 4-5 long fish sticks. Put the filets down the assembly line: flour, egg wash then panko. Add to hot skillet...lightly pan fry each side for 3 minutes. Serve w/lemon wedges plus HGK Tarter Sauce or natural Ketchup. Enjoy! Just completed the 1st run of Wild Mushroom Shepherd's Pie. Organic potatoes, onions, herbes de provence, variety of organic wild mushrooms, portobello, Parmesan, organic cream, butter and local eggs (used at end of pie so that a sprinkle of Parmesan sticks to it). The most popular request is the dozen 3" mini pies, clients are freezing them and will pop them out individually for a lite lunch with a lovely salad or serving it as a side dish. These are presented in a molded foil packet, very convient for freezing, you can seal all four sides of the foil w/a peak and freeze. Everything fabulous. 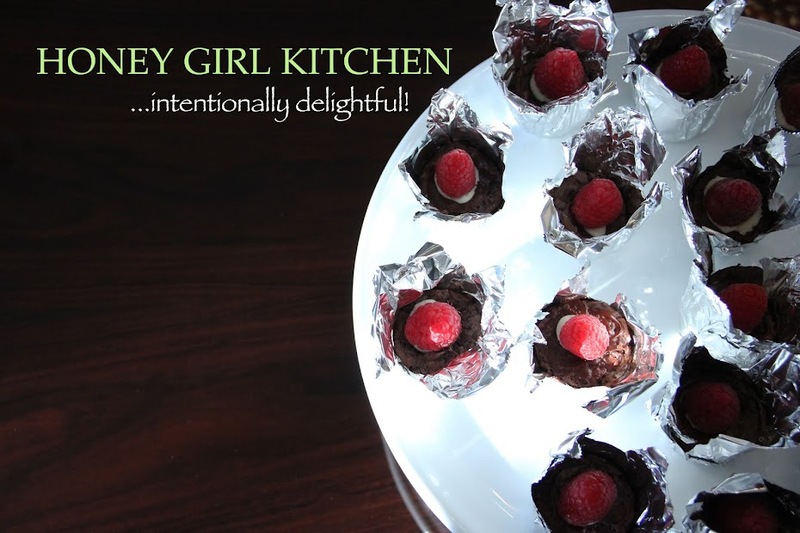 The photo below was taken at a clients Christmas party catered by Honey Girl Kitchen. Next week we're bringing back the Chicken Pot Pie...so many requests for it. It will be offered as well as the monthly specials. Freezes nicely.